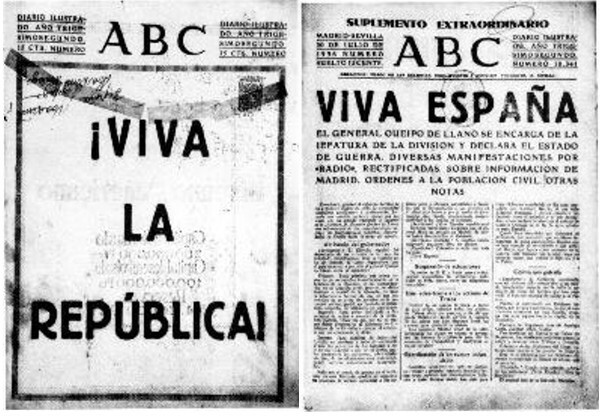 The ABC is an influential right-wing newspaper, strongly associated with the Partido Popular. Today, ABC is the third largest general-interest newspaper in Spain, and the oldest newspaper still operating in Madrid (though not in Spain). 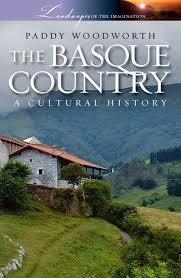 It was founded in Madrid in 1903, by Juan Ignacio Luca de Tena as a weekly newspaper but turned daily two years later. 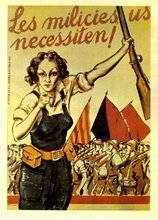 In 1936 at the outbreak of the civil war, the Popular Front took over the Madrid-based paper, while the Seville edition continued in the original family’s hands. Thus two different versions from either side of the ideological divide were published until 1939, when the paper reverted back to its monarchist (and at the time, fascist) line. Indeed, its owner Juan Ignacio Luca de Tena had paid for the plane, a dragon rapide, which took Franco from the Canaries to Spanish Morocco to begin the rebellion against the Republic. Here below, ABC editions from either side on the day of the rebellion. The ABC continued to support the dictatorship, though by the time of the Transition its line was neither nostalgic-Francoist nor particularly anti-democratic. It has traditionally taken a firm Catholic line on abortion and divorce and is considered the voice of Roman Catholic Spain. As Giles Tremlett in Ghosts of Spain points out, this does not stop the ABC, like all newspapers in Spain, from carrying adverts for prostitution. The paper has gradually lost ground to the supposedly more liberal El Mundo, and more recently has been supplanted to the right by the populist rag La Razón as Spain’s most widely-read conservative paper. 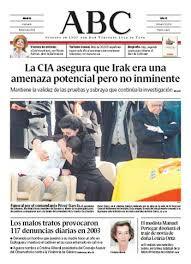 The literature and arts section of Saturday’s ABC is well respected by Spain’s intelligentsia, both right and left. The newspaper has recently been bought out by the Vocento Group and claims to take a more moderate stance now than other conservative media, for instance, refusing to support conspiracy theories related to the 2004 Madrid train bombings (11-M) and alleying itself with the moderate wing of the Partido Popular. It clearly needs to gain some space lost to El Mundo and more recently to El Razón. But, it remains to be seen whether ABC will be able to shake off its stuffy, old fashioned authoritarian image and attract younger readers as its own faithful drop off, as it were. Although ABC is a national paper, it is a relatively unusual sight in most of Barcelona, where the liberal-conservative La Vanguardia is your centre-right choice of read. Note that chaqueteo (literally jacket changing – switching your political stance to gain an advantage) enjoys a long, healthy tradition among the Catalan bourgeoisie.